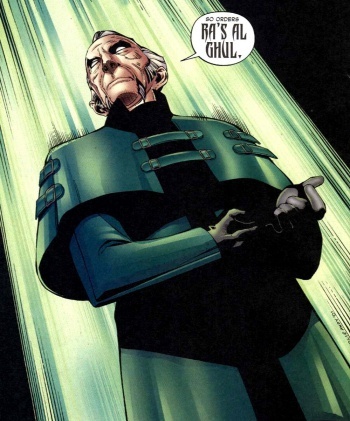 DC Comics villain Ra's al Ghul arrives on Arrow this fall, but no casting announcements have been made. The CW has teased Ra's al Ghul as the villain in the upcoming third season of Arrow, but an actor for the role has not been announced. Liam Neeson, who played Ra's al Ghul in Christopher Nolan's Batman trilogy, told MTV News that he would gladly reprise the role for television. "I would, in a heartbeat, if it came my way, yeah," says Neeson. "Very much so." Unfortunately, Neeson says that neither The CW nor Warner Bros. has approached him for the role, and with the third season premiering in October, it's likely that another actor has already nabbed the villainous part. In an interview in August, DC Comics Chief Creative Officer Geoff Johns made it clear that the television and movie universes exist separately, unlike Marvel's Agents of Shield. "We will not be integrating the film universe with the television universe," says Johns, but the television shows do have some integration. "Arrow and Flash absolutely live in the same universe. Gotham is set in the past, so it's a very different show. Constantine is in the supernatural world, whereas Arrow and Flash are kind of at the center and heart of the DC Universe," says Johns. "That's why you see characters like the Atom and Firestorm and others we're talking about right now... You'll see a lot of DC Universe characters. You won't see Batman. You won't see Superman." Neeson had some advice for the next actor to take up the role of the DC Comics villain. "They have to believe in their philosophy," says Neeson. "Ra's al Ghul absolutely believed what he was doing was ultimately saving civilization, and it was quite a good argument he comes up with. Throughout the ages this fraternity, that brought the plague to wipe out a section of mankind because it needed to be regenerated again. Very dangerous, but you have to believe it." The extended trailer for Arrow's third season gives a glimpse at a reimagined costume for Ra's al Ghul, which draws more heavily on his ornate comic book look than the black, ninja-esque outfit seen in Nolan's movies. Arrow premieres Wednesday, October 8 at 8 pm Eastern, on The CW. The first season of the Arrow spinoff series The Flash premieres October 7 at 8 pm Eastern. Fans got an early viewing of the premiere at San Diego Comic Con, and The Escapist's own Ross Lincoln was there to review it.